Food/Type of allergen:An extract of Fenneropenaeus indicus was reported (Nagpal et al. 1987)  but its use for SPT was not mentioned and commercial extract may have been used. Number of Patients:Shanti et al. (1993)  report SPT from 4 patients. Summary of Results:Shanti et al. (1993)  report that the 4 patients whose sera were used gave positive skin tests. Food/Type of allergen:Shanti et al. (1993)  extracted tropomyosin from uncooked shrimp and purified it by ethanol precipitation, ammonium sulfate fractionation and isoelectric precipitation. Nagpal et al. (1989)  and Shanti et al. 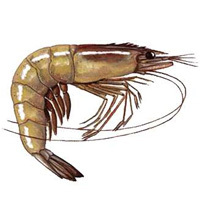 (1993)  purified the allergen Pen i 1 (SA-II) from boiled shrimp by ion exchange chromatography on DEAE-Sephacel and size exclusion chromatography. Number of Patients:Shanti et al. (1993)  tested sera from 4 patients. Summary of Results:Shanti et al. (1993)  report IgE binding to Pen i 1 (tropomyosin) in ELISA and IgE binding to tryptic peptides of Pen i 1 in ELISA and dot-blot immunoassay. Immunoblotting separation:Shanti et al. (1993)  used 15% SDS PAGE by the method of Laemmli (1970) . Immunoblotting detection method:Shanti et al. (1993)  transferred proteins to nitrocellulose by the method of Towbin et al. (1979) . Immunoblotting results:Shanti et al. (1993)  showed that the allergen Pen i 1 and purified tropomysosin both bound human IgE as a band at approximately 34 kDa. Both also ran at 50 kDa in 6 M urea (with staining for protein). Nagpal et al. (1987)  do not give details of their recipe for DBPCFC. Daul et al. (1988)  used DBPCFC and open challenge. Number of Patients:Nagpal et al. (1987)  tested one patient. Symptoms:Nagpal et al. (1987)  report that one of two patients whose sera was used reacted to a DBPCFC to cooked shrimp without further details. Nagpal et al. (1987)  identified shrimp tRNA as an allergen. However, Besler et al (2001)  comment "existence of tRNA allergen not confirmed by other investigators". Rajagopal et al. (2000)  compared the allergenicity and antigenicity in mice of tropomyosin and maleylated tropomyosin from Fenneropenaeus indicus. Maleylated tropomyosin was shown not to bind human IgE and to show reduced antigenicity. However, it showed a similar T-cell response to native tropomyosin. Rajagopal D, Ganesh KA, Subba Rao PV. Modulation of allergen-specific immune responses to the major shrimp allergen, tropomyosin, by specific targeting to scavenger receptors on macrophages. Subba Rao PV, Rajagopal D, Ganesh KA. B- and T-cell epitopes of tropomyosin, the major shrimp allergen. Nagpal S, Metcalfe DD, Rao PV. Identification of a shrimp-derived allergen as tRNA. Sequence Known? :Only 9 peptides were sequenced. Shanti et al. (1993)  digested Sa-II and tropomyosin with trypsin. Two peptides, FLAEEADRKYDEVAR and MQQLENDLDQVQESLLKANIQLVEK corresponding to residues approximately 153-160 and 50-66 of tropomyosin individually blocked up to 50% of IgE binding to tropomyosin at 100 pmol/ml. A 1:1 mixture also blocked to 50% without any additive effect. 4 other peptides inhibited up to 20% of IgE binding. Also see data for the very similar allergen Pen a 1. IgE cross-reactivity is likely with many invertebrate tropomyosins. See data for the similar allergens Pen a 1 and Met e 1. Naqpal et al (1989)  purified two heat-stable allergens, designated as Sa-I and Sa-II, from boiled shrimp (Fenneropenaeus indicus) extracts. Sa-I was isolated by ultrafiltration, Sephadex G-25, and diethylaminoethyl-Sephacel chromatography and gave a single band on SDS-PAGE at 8.2 kDa. Sa-II was purified by successive chromatography on diethylaminoethyl-Sephacel, Bio-Gel P-200, and Sepharose 4B columns. It gave a singe band at 34 kDa on SDS-PAGE. Shanti et al. (1993)  used competitive ELISA inhibition to show that Sa-II bound IgE identically to tropomysosin purified from raw shrimp (Fenneropenaeus indicus). Sa-II also ran similarly on SDS-PAGE and HPLC of tryptic digests were superimposable. They also showed that Sa-I was a fragment of Sa-II. EERAETGESKIVELEEELRVVGNNLK, SNQREEEYKNQIK, AEFAER, DELVNEKEKYKQ were reported by Shanti et al. (1993) . These sequences differ in 4/150 amino acids from Met e 1 after alignment (Leung et al, 1994 ).